For over four decades, UDA has been leading and shaping the urbanisation of Kuala Lumpur and the Klang Valley as well as other major cities in Malaysia. The real estate and property sector is one of the most dynamic industries in Malaysia and in the world. As the nation has developed, so too has UDA. In an economy with fierce competition and constantly changing markets, UDA has reinvented itself, growing in stature and scope from humble beginnings to be one of the top 10 key players in Malaysia. As we enter a new phase of growth at UDA, we face new challenges and exciting changes, while remaining firmly committed to providing the best possible service to all our customers and stakeholders. Whether you are an investor, a customer, or simply interested in our activities, I hope that this portal into our world provides you with an ample insight into our activities and services. It should also demonstrate the importance we place on balancing the needs of sustainability, socioeconomic development and profitability, and furnish you with an understanding of the values and culture that have helped set us apart, and will continue to drive us forward to our aim of becoming the top player in our industry. Finally, there is the opportunity to find out more about our team of whom we are so proud, and upon whom the realisation of our ambitions relies. Every member in UDA plays a vital part in ensuring our customers receive the best from us at all times. We constantly strive to find the best solutions that ensure sustainable long term relationships with our stakeholders, as we all strive to build a better Malaysia. 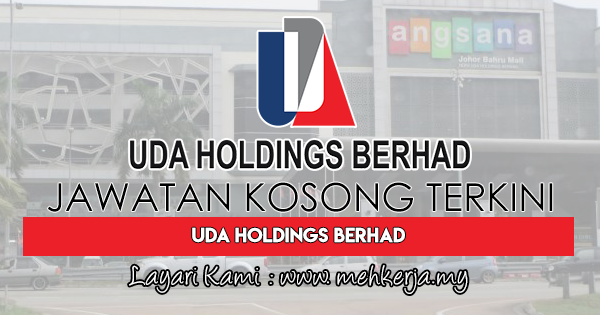 0 Response to "Jawatan Kosong di UDA Holdings Berhad - 26 Januari 2018"